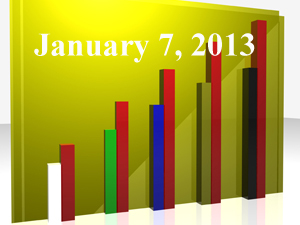 “2012’s Top 5 FiduciaryNews.com Stories,” (FiduciaryNews.com, January 2, 2013). Read them to remember last year. Read them to predict the coming year. OK, OK, so we dodged a bullet. But Washington still expects its pound flesh, only they tend to extract it by encouraging folks to convert their 401k funds into ROTH funds. Hmmm, penny wise, pound foolish. “DCs help bail out D.C. as budget agreement struck,” (InvestmentNews, December 31, 2012) Boo! Scared ya! In the end, they didn’t kill the golden goose. Instead, they made it easier to roll 401k assets into ROTH 401k plans. “Roth 401k Conversions For All Thanks To Fiscal Cliff Deal,” (Forbes, January 2, 2013) Though not as sweet as those conversions coming from traditional IRA plans, this new element might have employees knocking on plan sponsors’ doors seeking to have this benefit included in their plans. “Budget Deal Lets More Savers Convert to Roth 401k plans,” (Financial Advisor, January 3, 2013) Note to media: When you take time off, you get scooped by your rivals. “Cities Chart Course Through Pension Morass,” (ABC News, January 3, 2013) The fiscal cliff scare ain’t got nothin’ on this quagmire. Unless they figure a way out, someone of your favorite municipalities are in for one big heap of trouble. “Atlanta to San Diego: 7 Cities’ Pension Problems,” (ABC News, January 3, 2013) And here’s the list. “Illinois Dragging Feet on Huge Pension Problem,” (AdvisorOne, January 2, 2013) In the meantime, back in Smallville, the situation continues to worsen…“Fiscal cliff fix brings an upside to IRAs,” (BenefitsPro, January 3, 2013) Here’s a happy story to end the week (although you can’t tell from the publication date). It looks like the topic of fiduciary took the week off. Perhaps a little too much bubbly to bring in the new year. Oh, wait. That was last week. But it looks like we’ll be seeing a lot of lists. “401k Fee Transparency: Best & Worst Providers,” (AdvisorOne, December 20, 2012) We knew this was coming. Now, thanks to Dalbar and Research we have a ranking system. Looks like this topic went to the same party with fiduciary.